Uncertainty over the driving forces of current W. African climate, such as the W. African monsoon, the role that land use change and vegetation feedbacks, and aerosols play complicate projections of change in precipitation in the region as a whole. The IPCC states that climate projections for W. Africa should be "viewed with caution", suggesting the need for robust adaptation strategies that help to deal with current problems, and aren"t reliant on specific projections of change. 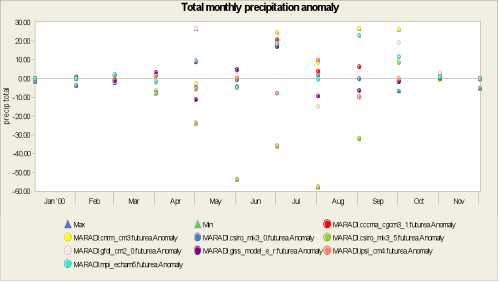 Precipitation at Maradi shows the same uncertainty as in the wider region, as shown by the figure below, where it is evident that during the rainy season the models disagree about the direction of change. The range of possible changes is large during the rainy season, and at the onset and cessation of rains, making it difficult to draw conclusions as to type of change expected. Average monthly maximum temperatures are expected to increase by 1-4C for the period 2046-2065 according to downscaled results from 8 climate models to provide data for Maradi. The range is due to differences between the models, and also between the months in the year, with the maximum increase shown from March-May.